In this challenge one member of each team (Saigon/Hanoi) will have to create a super fancy dish using basic equipment in a ridiculous kitchen setting. Fahbio (aka Chef) knocked it out of the park with his foie gras prepared on a hot plate in a motel in France. Now SWMBO will attempt to beat the chef at his own game. Outwit, outlast, outcook. 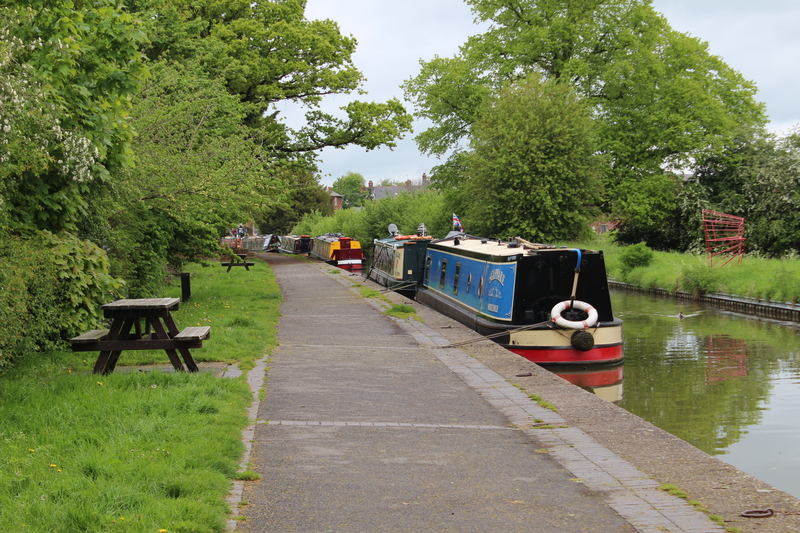 We are puttering down the Llangollen Canal in our narrowboat and the route we are following pops in and out of Wales so that we are never quite sure what country we are in. Those of you who know me personally know that I love foraging and at home I often combine walking, friendship and foraging. In fact, I can’t think of a better way to spend a Saturday than walking 20 kilometres with a dear friend gathering and collecting as we chat. 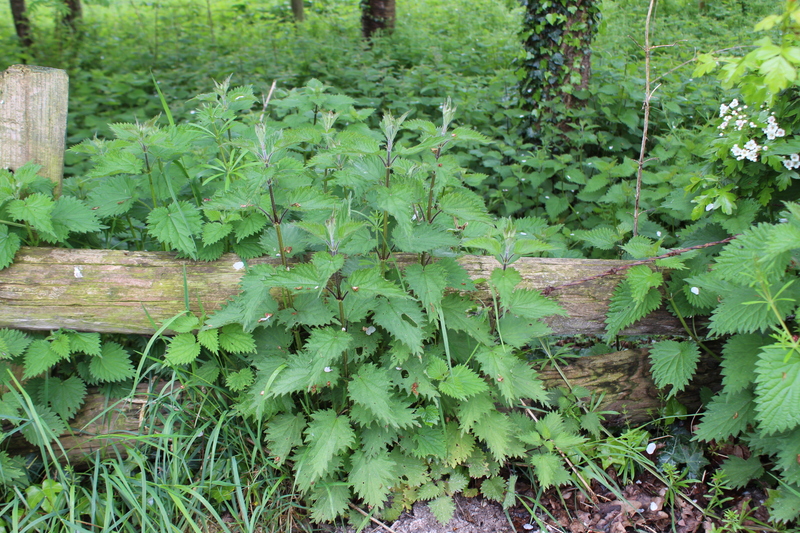 Today, I set about gathering stinging nettle (or stinging metal as a certain Lastborn calls it). 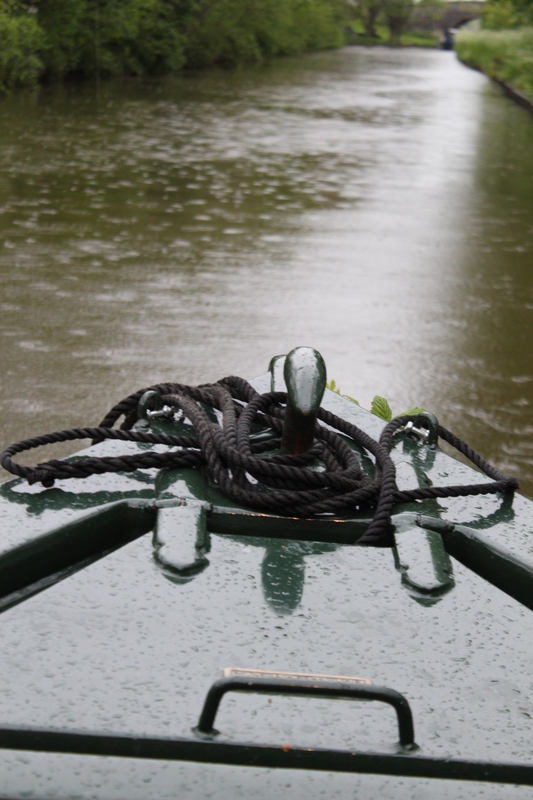 Stinging nettle loves to grow close by water so we see it all along the canal as we glide by. Spring in England comes more gently and slowly than in Canada – each day around 10 or 15 degrees Celsius with much rain mixed into the sunshine. 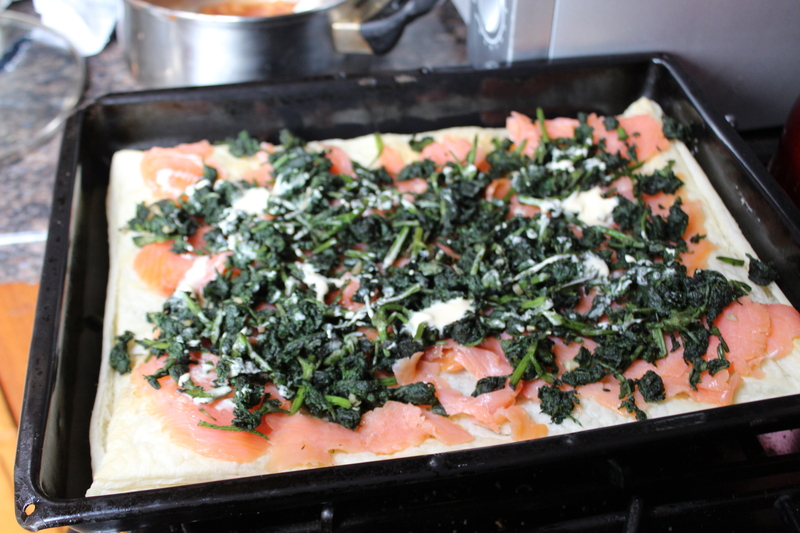 Here is my recipe for Stinging Nettle and Smoked Salmon Pizza. 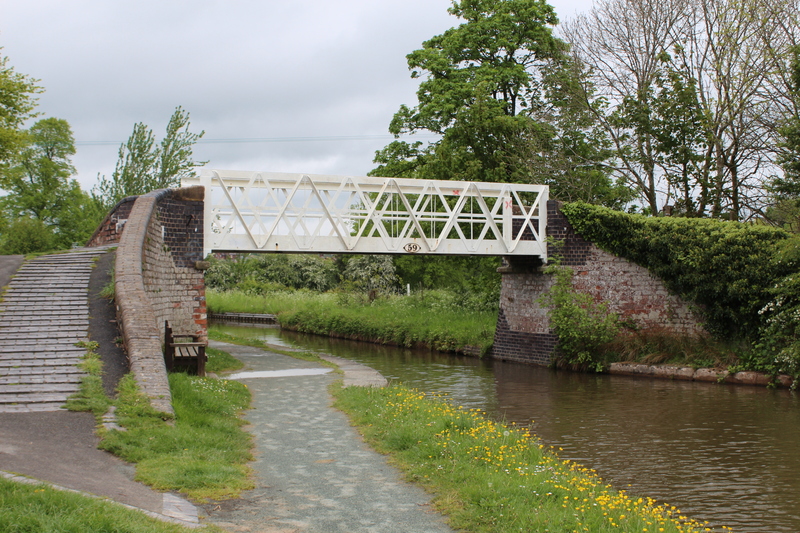 Carrying tongs, a large pot and kitchen scissors, walk along the Llangollen towpath until you reach bridge #59. Cross under the bridge, heading towards the village of Ellesmere. On your left, find an opening in the barbed wire and scooch in. Remember that there are poisonous snakes (adders) around here so be careful of holes in the ground. 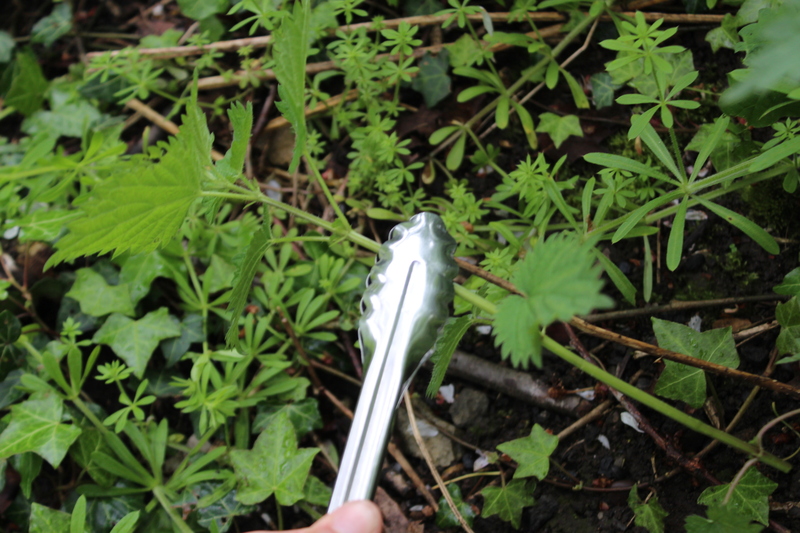 Hold the nettle stem with the tongs and snip the top of the plant off. You want to gather young plants before they flower. Personally, I find wearing gloves cumbersome and unnecessary. You may wish to wear them but you can still get stung through clothing as I proved two days ago when I waded into a patch of stinging nettles. It was the only place to gain a footing to try to pull the barge back to deeper water when we got stuck. Stung all over my knee through my jeans. 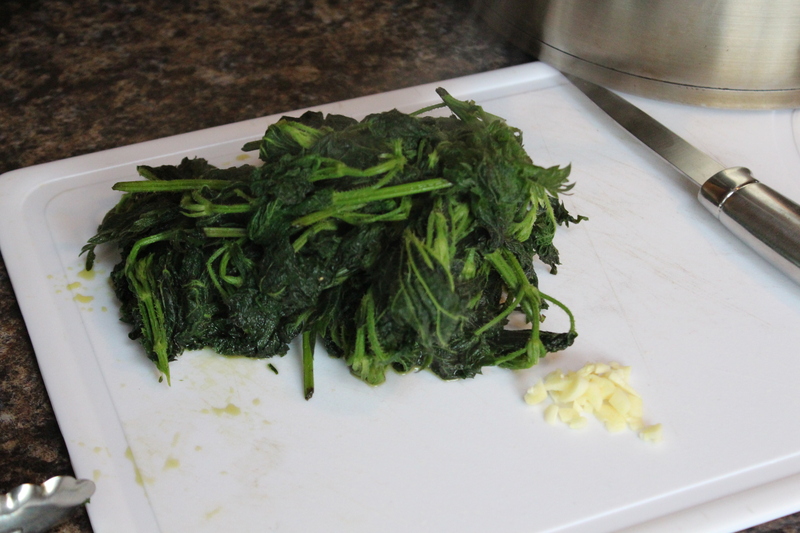 Gather a lot of nettles because they will shrink down considerably as they cook (think of spinach). 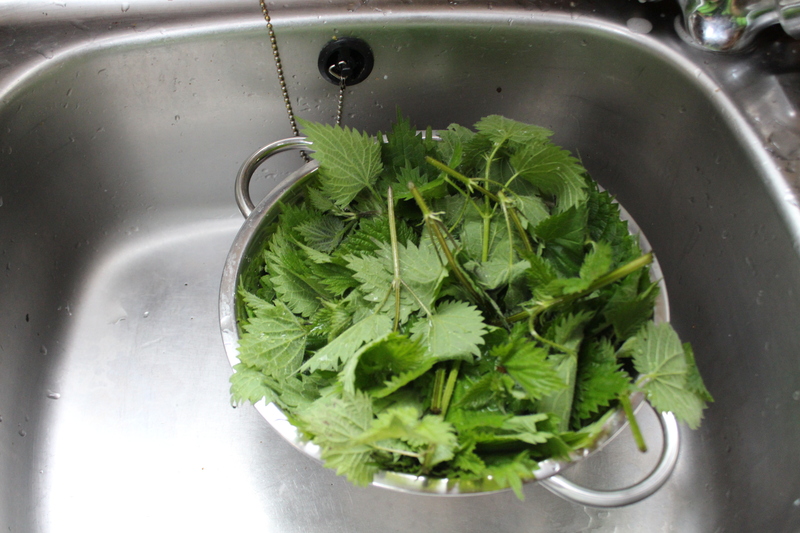 Once you have a potful of nettles, take them home and rinse them without touching them. Return them (wet) to the pot. 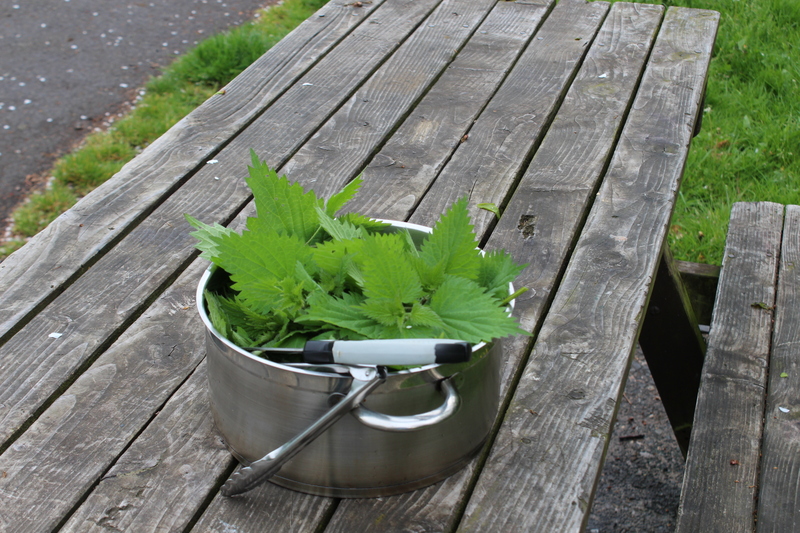 Put a lid on the pot and cook the nettles until they are done. You may have to add a touch of water. You will think the nettles are safe to touch but remember that they are burning hot! Chop the nettles and now you can do whatever you want. At our place this week, we will be eating stinging nettle soup; stinging nettle with a knob of foie gras fat melted in; stinging nettle sautéed with garlic and chili; and of course, our lovely pizza. The nettles gathered today will be enough for one generous sized pizza. 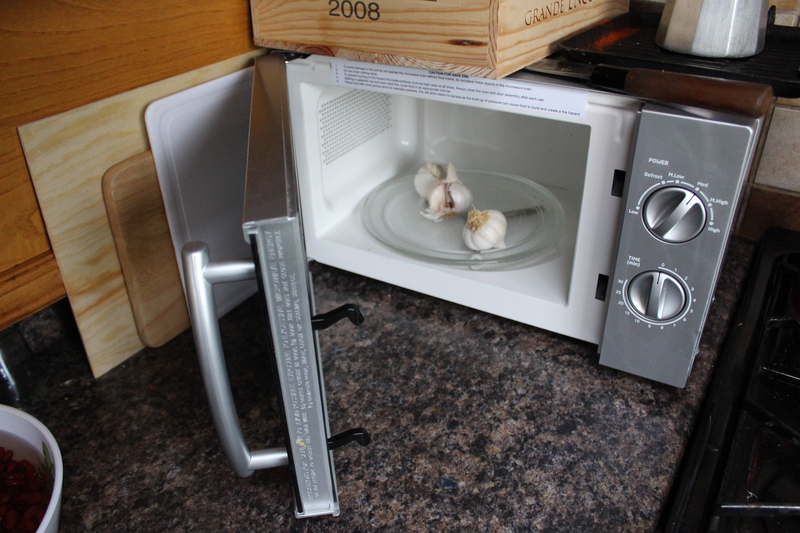 Reach into your garlic-storing device and grab a clove. 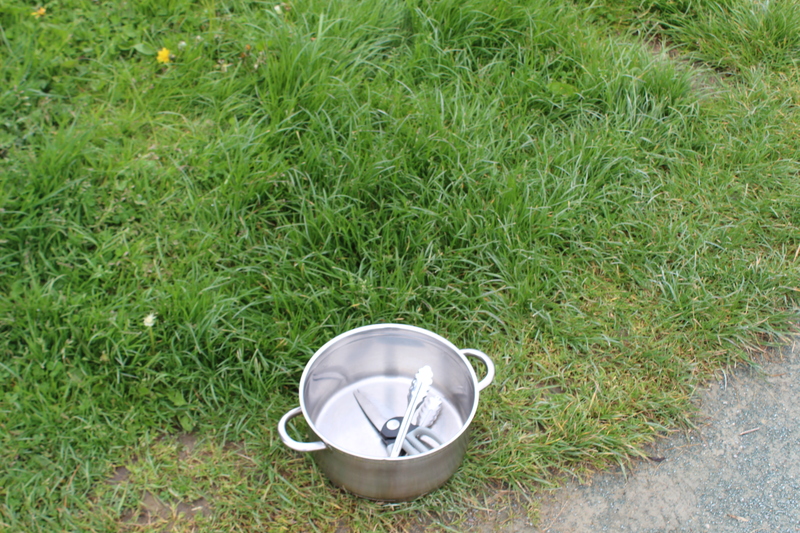 Add a bit of oil to your pot and cook the garlic and nettles until dry. You don’t want your pastry to get mushy. Because smoked salmon is so salty, don’t season the nettles. While the nettles cook, admire the view. You can use the garlic storing device for another purpose?! You learn something new every day! Roll your puff pastry out. If you have made your own puff pastry you already know how to make stinging nettle pizza. If you are mortal like the rest of us, don’t read the ingredients on the puff pastry packet because they are hideous. I never (well except today) use puff pastry for that very reason. I prefer to make my own pizza dough using a sour dough starter or to make a piecrust. But I will not beat Team Saigon with simple peasant foods like that. Besides I don’t have the time, space or patience for that right now. And the sour dough starter is dying a slow death back in Canada. Bake the puff pastry for about 15 minutes. Baking it without the topping will prevent it from getting soggy. 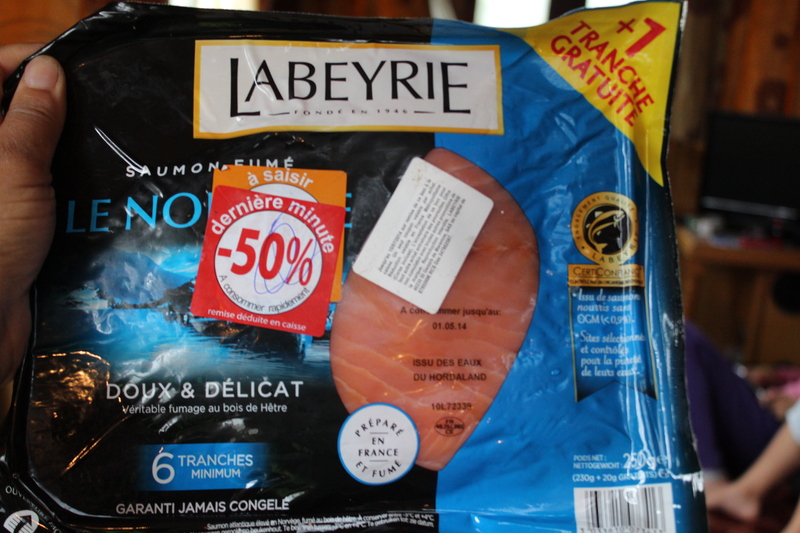 Open the package of top quality smoked salmon you bought on sale in France and lay the smoked salmon on the puff pastry. Top with the sautéed nettles. 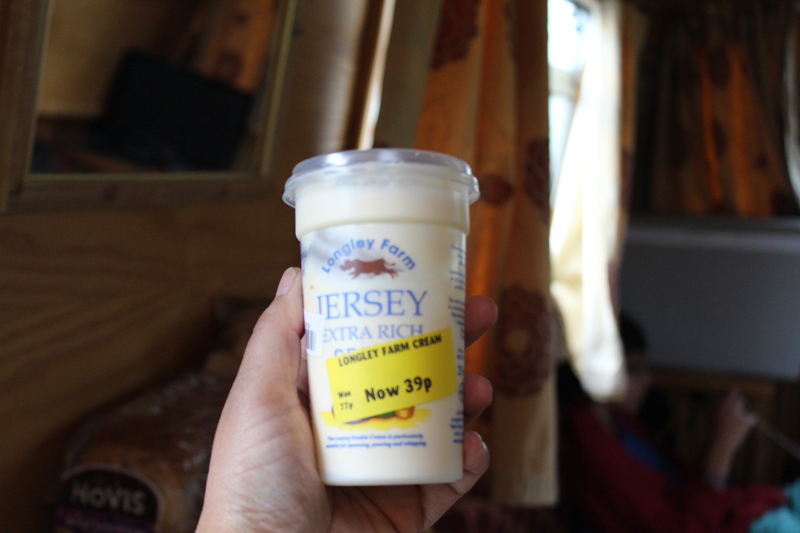 Dollop the beautiful thick cream you also got at half price over the top and return the pizza to the oven for about 8 minutes. Time it so that it comes out of the oven at 5:30 pm and serve with an aperitif. Enjoy while the rain patters on the water. So who won? Well, I call it a draw. SWMBO must have done something right to get five young palates to all agree that stinging nettle is delicious. Hopefully, the transfats and processed bleached flour were cancelled out by all the iron and vitamins in the greens. They sting!! Seriously. The leaves and stems have little hairs that will really hurt if you brush against them. Your skin will blister. Make sure you know what you are gathering. Never eat any wild foods if you don’t know what they are. 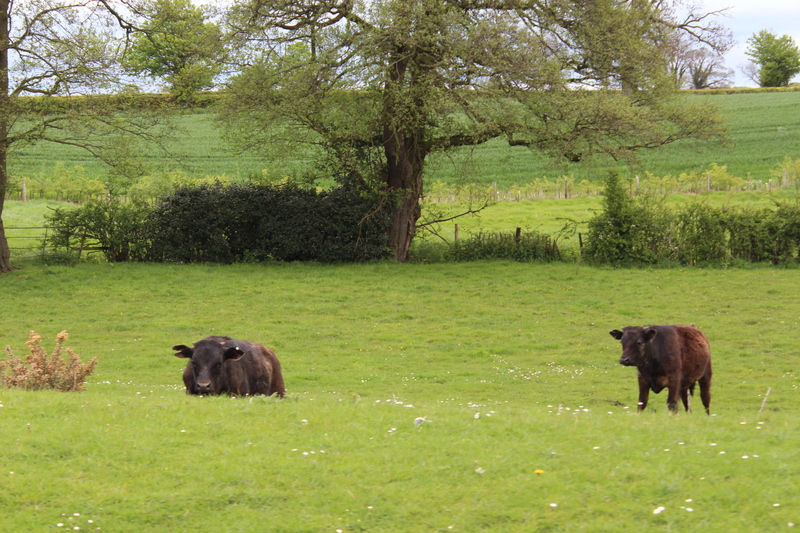 Gather them from an area you are confident is safe. 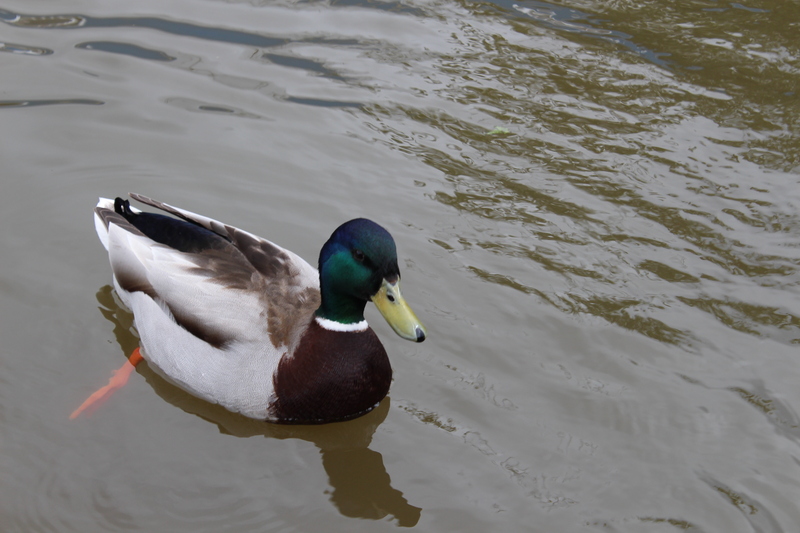 I was leery of gathering along the canal since I believe there are a lot of pollutants, like oil, in the water. I also wanted a zone that wasn’t along a dog-walking route. Cook them before you eat them! Cooking softens them and makes them edible. NOTE 2: I plan to write a future blog post on how to save money on grocery shopping including buying reduced items. For now, I would just like to say that good quality food is good quality food regardless of price and quality is what we should be going for. The salmon used today was top quality Norwegian salmon, never frozen. Just because something costs more does not mean the quality is better and just because the price of something is lower does not mean the quality is less. Being a savvy shopper is a valuable skill that anyone can learn. I do not advise buying the following close to expiration date: nuts, oils, baked goods, processed foods, grains. Just when you think you couldn’t do anything else to top others posts and then you come out with this yummy post. Foraging just happened to be on my mind as I biked along a really beautiful canal today. Now how to get someone to make me a stinging nettle pizza? Yum! Yum! I think I will try a pizza like yours. I just have to see if there’s any stinging nettle right now. It might be a later in the season thing? We love to hear about foraging as we are trying to more of it ourselves. Wild leeks anyone? hmm…maybe that should go on pizza? Nettles should be ready in your part of Canada now. They can be hard to find though. Happy Mother’s Day to you as well (a little late!). btw Happy mother’s day SWMBO!